The leader of a group of Ishvalan survivors, he has repeatedly cared for Scar when Scar was injured in Central. After the mercenary raids against the Ishabalan camp in Central he moves his group further south. 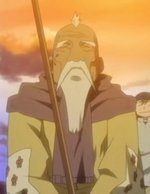 He is never mentioned by name in the anime nor the manga, though he was identified as Rick and Leo's grandfather in the anime episode Marcoh's Notes. Fullmetal Alchemist (Hagane no Renkinjutsushi) deals with some pretty heavy material: loss, revenge, good, evil, love, death. It has it all! Because the show has so much substance, there are some absolutely beautiful quotes that are sure to inspire any viewer.